Sign Up for our Spring Session! Is your middle-schooler looking for something fun and unique to try out this spring? 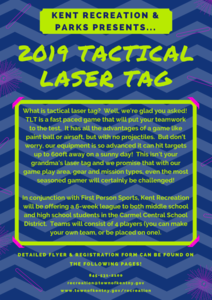 If so then look no further than Kent Recreation & First Person Sports' Tactical Laser Tag League! What is Tactical Laser Tag? Good question... TLT is a fast paced game that will put your teamwork to the test. It has all the advantages of a game like paintball or Airsoft, but without the projectiles, which most parents would agree is a very good thing! It's like your classic arcade-style laser tag, but just taken to a whole new level! This fall, Kent Recreation, in conjunction with First Person Sports, will be running a 6-week TLT league open to middle-schoolers in the Carmel Central School District. Teams will consist of 4 players (you can sign up as a team or as an individual to be placed on a team) with teams competing against each other each week at Edward Ryan Memorial Park. Registration for the program is now open, so CLICK HERE for complete program details and a copy of our registration form. With questions please don't hesitate to send us an e-mail or give us a call. PLEASE NOTE THAT THIS PROGRAM WILL BE CAPPED AT 48 PLAYERS AND SIGNUPS WILL BE TAKEN FIRST COME, FIRST SERVED.